When it comes to your material storage, Adaptive Engineering has you covered. Our surge hoppers are available in material capacities varying from 6 to over 1,000 cubic feet. Hoppers can be square or round and vary in cone angle based on material characteristics. 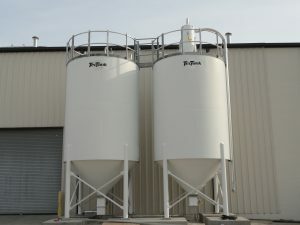 Customization of hoppers includes square, round, or rectangular bodies with square, round, or rectangular outlets to meet material flow requirements. 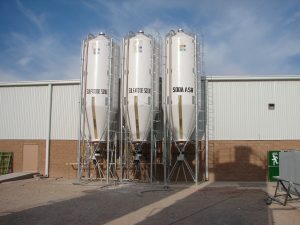 The heavy-duty construction of the bins is designed to withstand varying process conditions. This heavy-duty construction also allows the mounting of equipment such as cyclones, baghouses, and receivers directly on the bins. Inlet and outlet flanges are fabricated to meet the customers’ requirements.